I love this time of year. The evenings are stretching and the garden is coming back to life. It’s a time for planting seeds, watering seedlings and getting out for extra walks now that the dark mornings are finally behind us. I’ve noticed the nettles are coming back to life and I’m anticipating a bowl of green soup and some nettle tea to get the system clear and clean. Nettles are freely available and have many benefits. It's best to avoid those on the side of busy roads, look for clumps in wild fields and gardens. I wear gloves when I pick them or use a scissors, carefully cutting the top head into a colander until I have a full bowl of them. Rinse them off carefully, then they’re ready for tea or soup. For tea, I use a cafétiere or similar pot and let them soak in boiling water for at least 10-15 minutes before drinking. 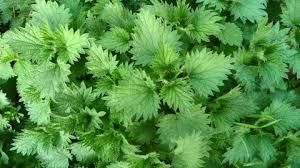 The most important health benefits of stinging nettle include its ability to detoxify the body, improve metabolic efficiency, boost immunity, increase circulation, improve energy levels, manage menstruation, minimize menopausal symptoms, and aid in skin care. It has the power to protect the kidney and gallbladder health, lower inflammation, increase muscle mass and regulate hormonal activity. What’s not to love? The herb garden is making a comeback too. I’ve a lemon balm bush that reappears every spring with fresh new growth and several hardy mint plants. I’ve found that lemon balm and mint go well together. Both are soothing and relaxing after eating or in the evening time. Both are simple plants to add to your windowsill or a back door step and will bring much simple pleasure. Other greens that can be found wild at the moment include wild garlic and dandelion leaves. Dandelion leaves are rich in vitamin C, A and E, along with small amounts of several B vitamins. The leaves also contain several important minerals, including calcium, iron, magnesium, phosphorus, and potassium. In addition to these beneficial nutrients, dandelion leaves contain other natural compounds with medicinal properties. Traditionally they were used to cleanse the liver and kidneys. You can pick some leaves, wash them and chop them up into a salad in small amounts, they are quite bitter so it’s useful to mix them up with other salad greens. Wild garlic will also be found at the moment in many woodland locations. I’m a big fan. So much so that we’ve transplanted some to our own garden from the woodlands of Woodstock House in Co. Kilkenny. So I can confirm that it transplants well and is thriving in our own little woodland in the shade of some birch trees! It’s delicious chopped into a salad or added to a sandwich. Everytime you go for a walk or stroll through your garden have a look at what may be growing around you and if you might be able to add some green to your day and some spring to your step!